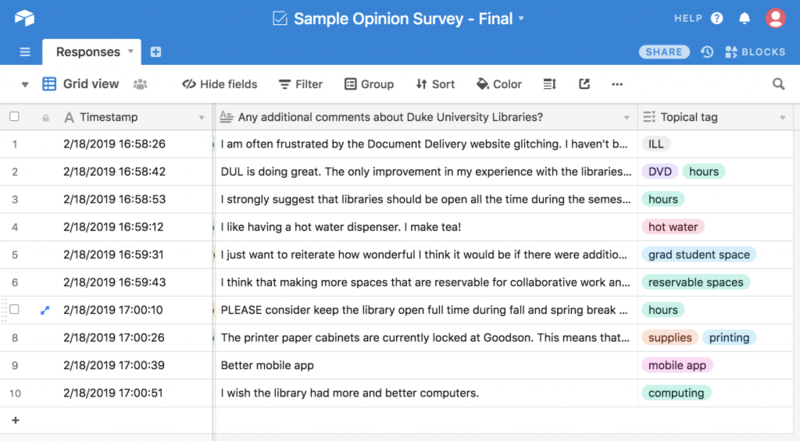 The Assessment & User Experience department at Duke University Libraries keeps the libraries’ physical and virtual spaces responsive to user needs by constantly gathering feedback. In additional to our biennial user satisfaction survey, we run usability tests, hold focus groups, and host meetings of our student advisory boards, all in an effort to keep a finger on the pulse of the DUL patrons. These activities can generate a lot of unstructured data! For example, in a typical meeting of our undergraduate advisory board, we might collect feedback from a dozen or more students, generating seven or more pages of notes and covering a range of topics. We review and act upon some of these comments immediately, but others may influence longer-term planning. As library staff, we know how important it is to store information in a way that promotes future access. This year we decided to pilot a new system for storing and describing our unstructured data. Enter Airtable. If you’re not familiar, Airtable is a cloud-based database solution. Similar to Google Sheets, Airtable lets you enter and share data in your web browser, but it also offers more powerful features for projects that have messy data or interconnected components. There are many Airtable templates to show off the different features, including project trackers, event planners, and even product catalogs. For our messy data, we built a simple spreadsheet that was general enough to collect data from a variety of sources. 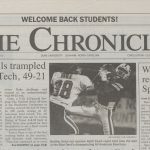 We included columns like basic demographics, the feedback provided, the original question or prompt, the date when feedback was provided, and how we collected the feedback. Then we took advantage of Airtable’s special features to create a column for topical tags. One of the column types in Airtable is called “multiple select“, which means you can add multiple tags to a single comment. Other spreadsheets can’t understand a list of tags in a single cell, but Airtable treats each tag separately and allows us to group and filter comments by each individual tag. The ability to look at comments across different feedback channels in one central location has enormous potential. 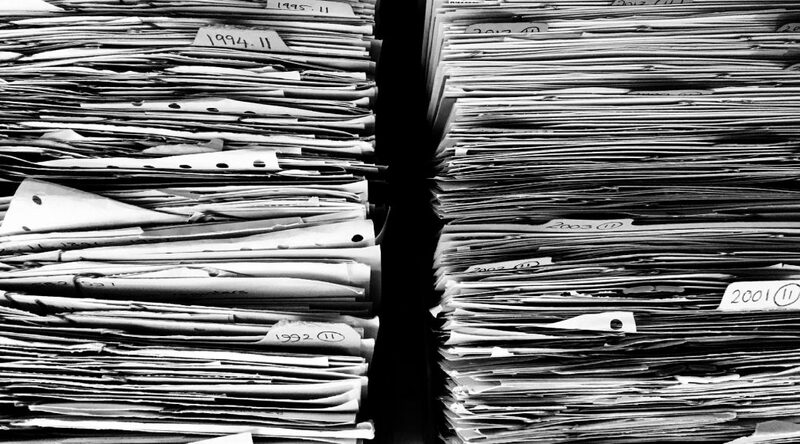 Instead of having to hunt through old Word documents or emails, we have a single database that can be searched, sorted, or filtered to explore trends in comments over time. When a question comes up about how patrons feels about a particular service or space, we can compile data much more easily, and we no longer have to rely on our memory of what feedback we’ve received and when. Airtable’s free accounts have a limited number of rows allowed in each database, but they do offer a discount on paid plans to educational institutions. We’re only just starting to explore the potential of Airtable, but so far we’ve been happy with the ability to collect our messy data in one place and organize comments with tags. Want to learn more? 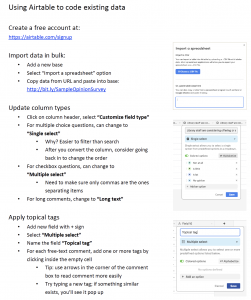 Take a look at our recent tutorial on using Airtable for coding survey data, originally offered at the Designing For Digital 2019 conference. What if it was possible to unwind – color, do a jigsaw puzzle, meditate – without leaving the Libraries? It is at Oasis Perkins! This high-ceilinged refuge is tucked into the fourth floor of Perkins in room 418. 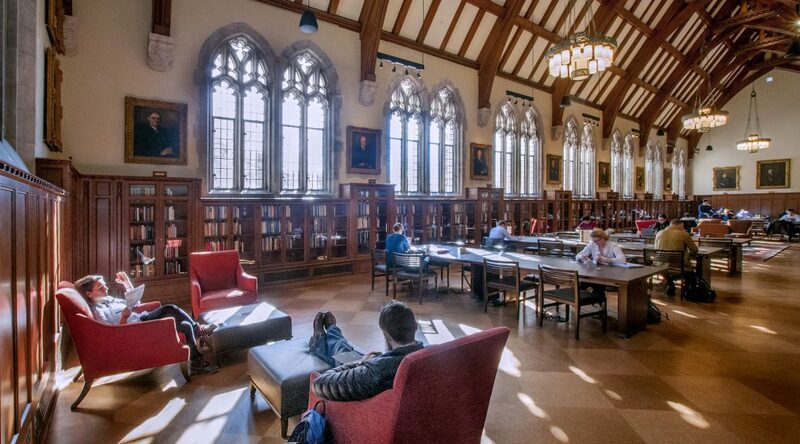 It’s a perfect place to escape any finals-related tension palpable in study spaces this time of year. 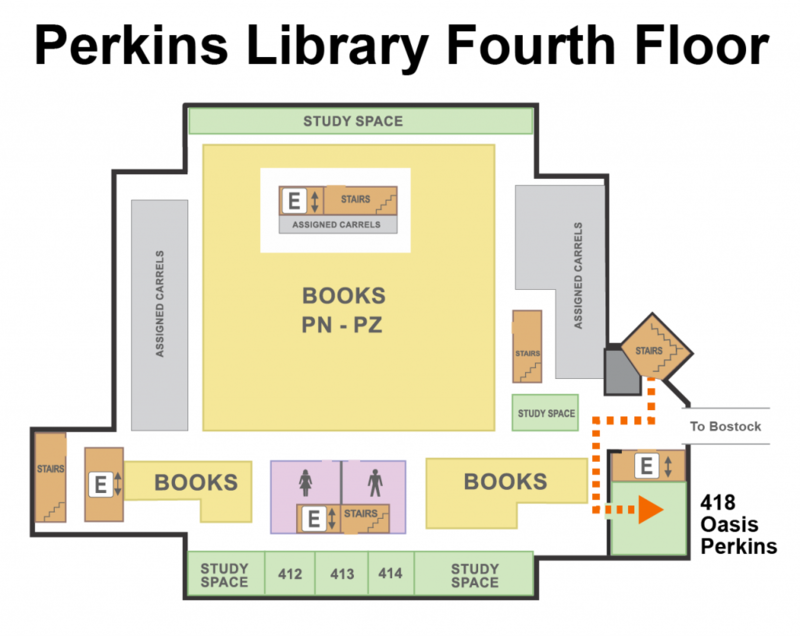 Unlike other fourth floor spaces in Perkins and Bostock meant for silent study, feel free to chat and connect with a friend or strangers, or simply sit and reflect quietly. How did Oasis Perkins come to be? We hope that Oasis Perkins can serve as a dedicated place for students to nurture their well-being, fitting into the ecosystem of Oasis West and Oasis East (which are managed by Duke Wellness). However, Oasis Perkins is located, of course, right inside of Perkins Library – and its doors don’t close. 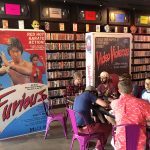 You’ll also find occasional events hosted in Oasis Perkins, from Koru Meditation classes to “Tea-laxation” events. Check out the Oasis Perkins webpage to stay up to date on events, or be in touch if your organization would like to host a relevant get together in this space! You can find a smaller space on the second floor at the Prayer and Meditation Room in Perkins 220. Duke Wellness Center – There are a lot of wonderful activities that happen with the Wellness Center each week to help support and de-stress students! Duke’s Counseling and Psychological Services (CAPS) – Free counseling on campus for students. Explore this website for how to get it started. Women’s Center – Explore services for all to promote a campus culture of agency and self-determination. Duke’s Center for Sexual and Gender Diversity (CSGD) – Learn more about the events and programming put on by the CSGD. Allies are also encouraged to participate and learn. Duke’s Center for Multicultural Affairs – Learn more about how the CMA aims to empower students and their organizations to create a vibrant and inclusive community on campus! Academic Resource Center – The ARC is here to help you be the best (and least stressed) student you can be. Free learning consultations and academic support provided. Oasis Perkins has existed in its current form for only one short semester! Is there something that could change about the Oasis Perkins that would help you re-charge? Our team at the Libraries would love to make it better for you. Fill out a feedback from in the suggestion box in Oasis Perkins, or reach out to brenda.yang@duke.edu with your comments or suggestions. 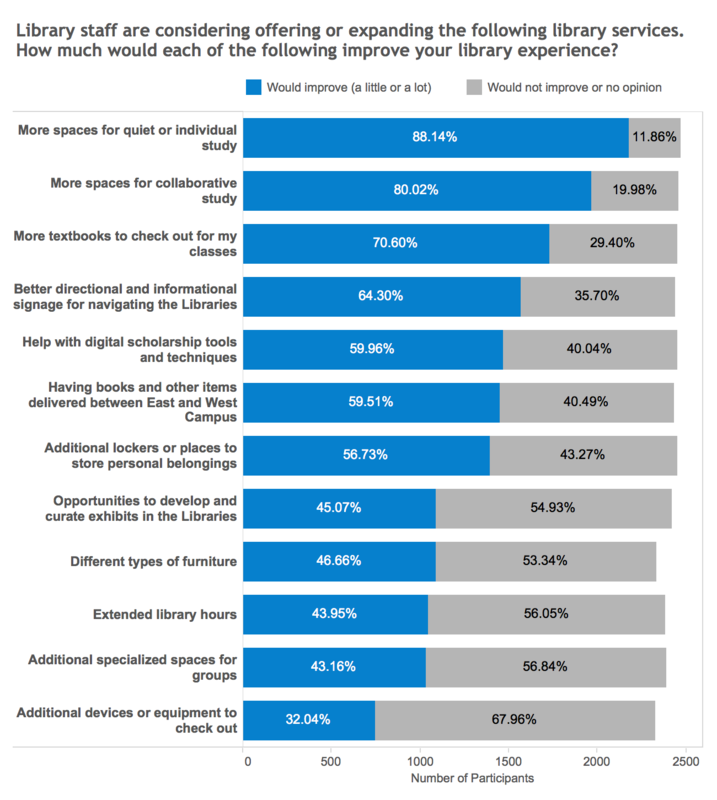 This spring, Duke University Libraries conducted the 2018 biennial user satisfaction survey, a large survey of students and faculty at Duke. The goal of the survey is to gauge overall user satisfaction and to gather specific ideas for improvements to DUL materials, services, and spaces. In this post, we’ll share some of the trends within the student responses. Since 2013, DUL has created custom surveys rather than use generic survey products, allowing us to customize questions to different patron groups and even different parts of the campus libraries system. Developing and analyzing the results of a customized survey, however, is no small feat! The survey is run every two years, in part because the full cycle of survey development, dissemination, analysis, and follow-up takes the entire two years. The 2018 survey was deployed in January 2018. A sample of students and faculty received personal invitations over email, but the survey was also advertised on the DUL website and open to anyone. We received responses from 2,610 students. 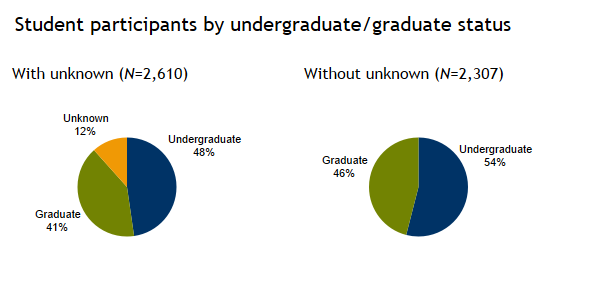 We don’t have full demographic information for everyone, but approximately 54% of the students for whom we have demographics were undergraduates. The survey took approximately five to seven minutes to complete. After the survey closed, a group of seven staff at DUL divided up approximately 3,600 free-text responses and manually coded them for topic and, where appropriate, whether they were a request for a new service or change in existing policy or a compliment. The survey data have been visualized in a series of public dashboards. 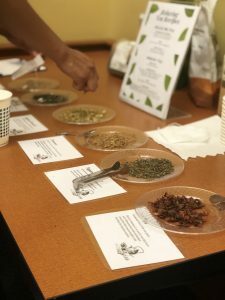 To gather additional information about some of the results, the Assessment & User Experience department also hosted several follow-up focus groups with both students and faculty. The focus group results, while not incorporated into the survey dashboards, have been incorporated into summary reports and recommendations. The survey included questions that everyone answered and questions that were specific to different libraries. 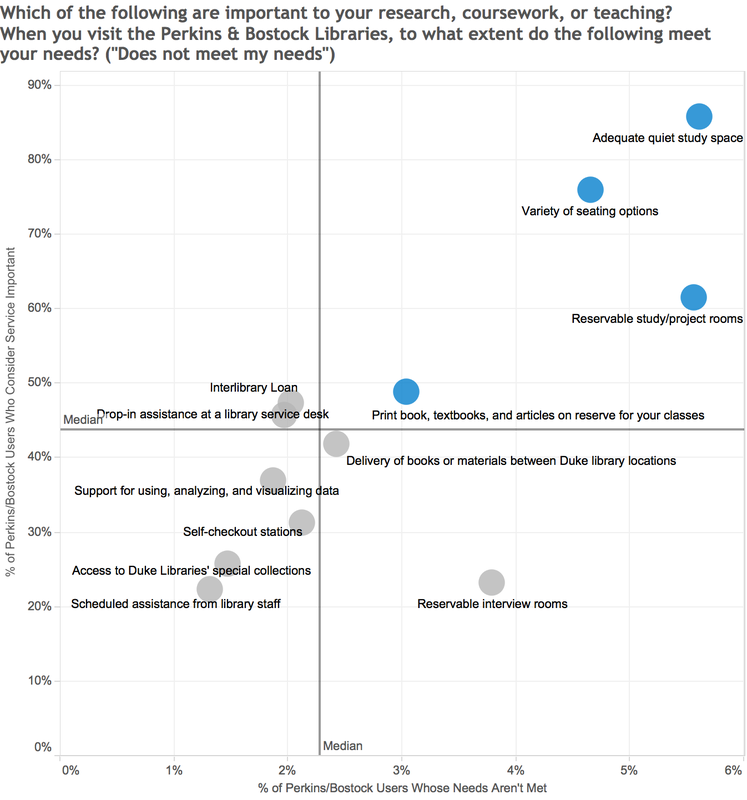 All survey participants identified which library they visited most frequently. 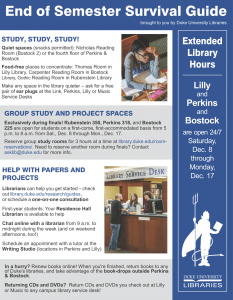 For students, 77% selected Perkins & Bostock as their primary libraries. Only 3% (76 students) reported that they don’t physically visit a library. The libraries are considered an important part of the Duke experience by over 80% of participants. Focusing on the students who picked Perkins & Bostock as their primary libraries, we can look at usage of and satisfaction with the library. Of the 1,978 students who responded, over 80% visit Perkins & Bostock at least once a week. 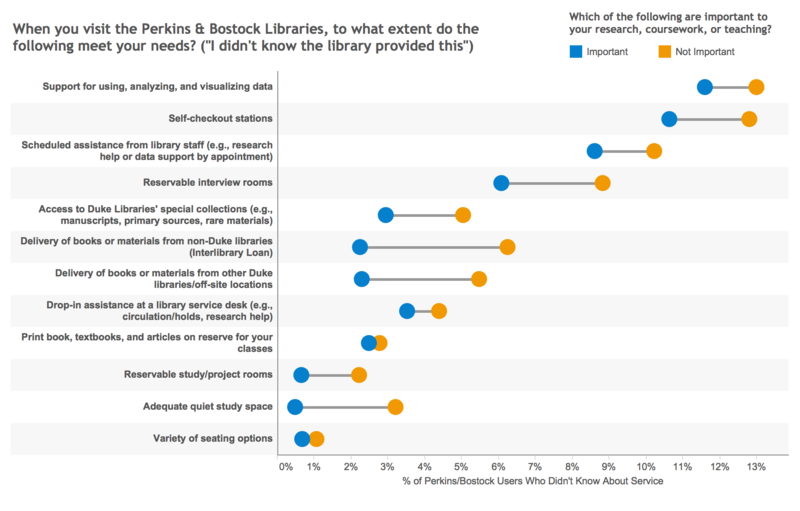 And by and large, students are quite satisfied with Perkins & Bostock. Less than 1% of responses fall in the “not satisfied at all” or “not very satisfied” categories, and the vast majority are very satisfied. The Duke University Libraries value diversity of thought, perspective, experience, and background and are actively committed to a culture of inclusion and respect. Beyond gauging user satisfaction, this year we also asked students about their impressions of Duke and DUL as safe spaces. (In the survey, “safe space” was defined as “a place in which people can feel safe from discrimination, harassment, and any other emotional or physical harm.”) We were excited to find that overall students agree that DUL is a safe space (92% respond with “agree” or “strongly agree”), even more than they agree that Duke University as a whole is a safe space (78% response with “agree” or “strongly agree”). Similarly, when asked if the library is a welcoming place, almost 90% agreed. Despite these encouraging numbers, we are committed to continuing to improve in this area wherever we can. Even though by-and-large students are satisfied with the libraries, they were not afraid to let us know what areas could be improved! They gave us their constructive criticism in a few ways. First, we asked students to offer their opinions on the possibility of expanding different types of library services. Next, we asked how important specific services, materials, and spaces were, as well as how they were meeting the students’ needs. Finally, we gave them the opportunity to offer additional comments about DUL and suggestions on how to make DUL more of a safe space. When we asked students what services should be expanded, students were most likely to vote for more spaces for individual study, more spaces for collaborative study, and more textbooks to check out. A second tier of requests include better signage, delivery of items between campuses, lockers, and help with digital scholarship. Looking at library-specific responses, we can find a bit more detail about these requests. When looking for services that are both important and not meeting students’ needs, we can see that reservable project/study rooms, a variety of seating options, adequate quiet study space, and textbooks on reserve all appear in the high quadrant for both importance and not meeting students’ needs. While not every student followed up on these questions with free-text explanations, the analysis of the free-text comments are consistent with these results. Of the 769 student comments that included requests for new services or a change in policy (rather than compliments), the top code was study/research space, which accounts for approximately 12% of the total requests. 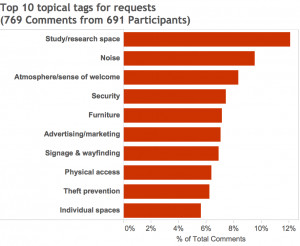 The second most frequent code was noise (about 9.5% of the requests), clarifying some of the complaints about “adequate quiet study space.” Requests often include a desire for the Libraries’ quiet space policies to be better enforced. The third most frequent code was atmosphere/sense of welcome – e.g., how inviting the library feels, feelings of “stress in the air.” This code was applied to just over 8% of the requests. Security, furniture, advertising, and signage also ranked highly among requests. 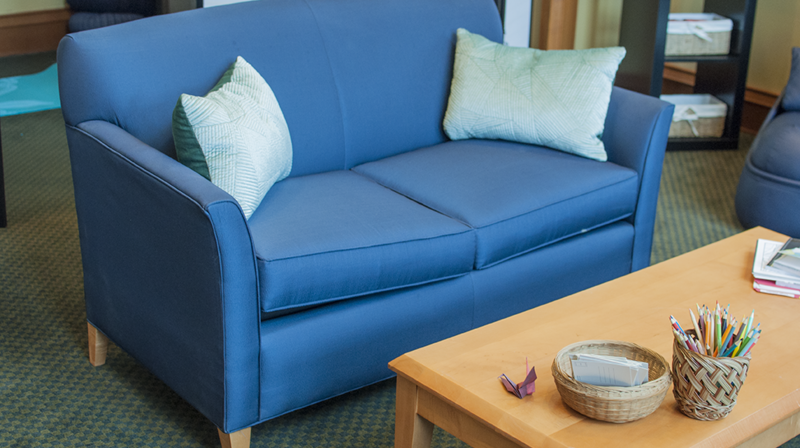 Students seem especially desirous of “comfortable” seating; write-in comments mention several types of comfortable seating by name, including couches and bean bags. While student needs and reactions change over time, one thing remains the same: they unknowingly request services we already offer. Sometimes the survey itself alerts students to particular services. 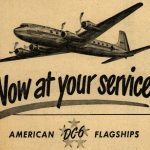 When we ask students how certain services are meeting their needs or which services should be expanded, we offer a choice labelled “I didn’t know the the library provided this.” Here are some of our most pressing “marketing opportunities,” according to the number of people who were unaware of the service. Another good indicator of marketing opportunities is our analysis of the students’ free-text comments. Some of the major requests from students actually match up well with some of our existing but possibly under-advertised services. We already know that students are always on the lookout for quiet study spaces. This need is especially pronounced for graduate students, who seem to feel outnumbered by undergraduates, who need quiet space for long periods to work on independent research projects, and who don’t always have private office space elsewhere on campus. When we asked students about services they would like us to expand, we offered them the opportunity to comment on “Additional specialized spaces for honors researchers, graduate students, or other student populations.” Out of 281 total comments on additional specialized spaces, 142 (or almost 51%) mentioned graduate students. In analyzing the comments and in follow-up focus groups with graduate students, however, it appears that many are not aware of either one or both of the dedicated graduate student spaces in Perkins Library. 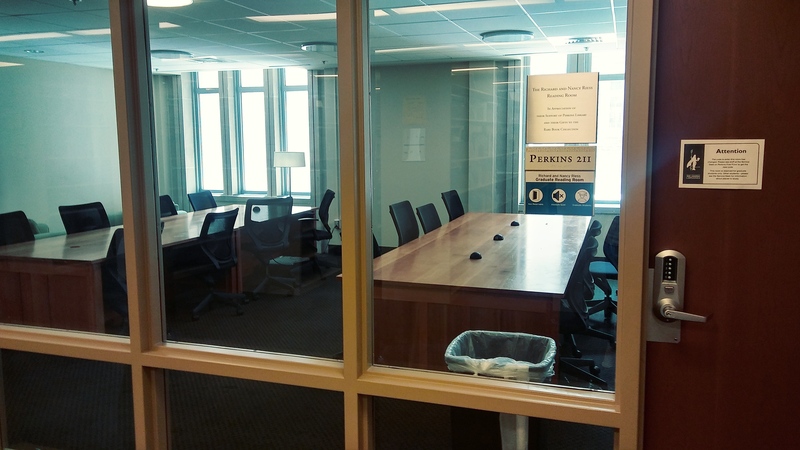 The graduate reading room is a shared reading space for graduate students on the 2nd floor of Perkins. It has a key pad entry code that can be obtained from the Library Service Desk. The room is has good natural lighting and is an “absolutely quiet” zone. 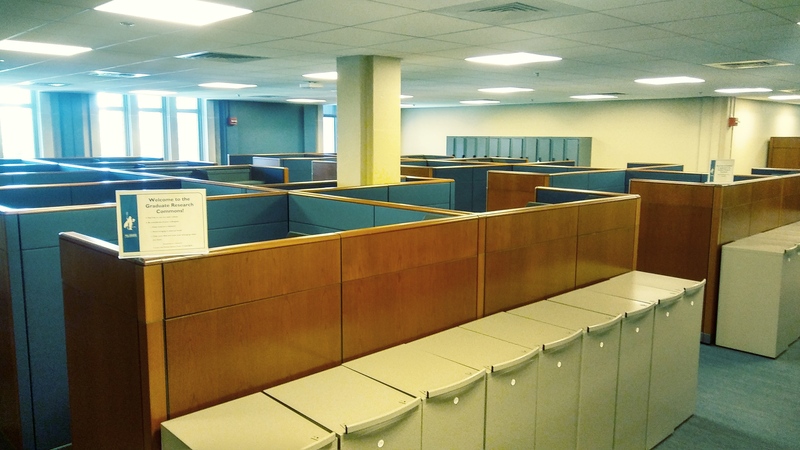 Some of the requests indicate that students would like more individual desks, however, so some students may be unsatisfied with this as the only dedicated space open to all graduate students. In the spring of 2016, a large room on the second floor of Perkins was converted into the Graduate Research Commons. The space has 27 individual cubicles of two different heights, adjustable sit-stand desks, and dedicated lockers for all users. The room also includes a technology center with an e-Print terminal, a scanner, and a desktop computer with the Adobe software suite. Unlike the Graduate Reading Room, however, students must apply for access to the Graduate Research Commons. Despite its many features, the space has been underutilized, and it appears that many students are not familiar with it and have never tried to apply for access. A review of this space could reveal ways to market and set policies for the space. To determine the most needed and feasible improvements for follow-up, the Assessment & User Experience department will host a DUL-wide staff workshop in July to review the results and make specific recommendations to improve the experience of all of our users. Contact us if you would like information more about this workshop. We look forward to sharing more of our progress on this and other assessment projects for DUL in the future!